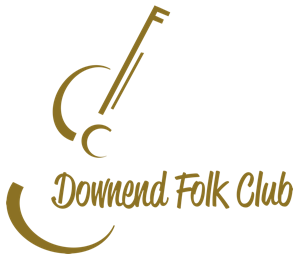 Downend Folk Club - REVIEW: "BRILLIANT STUFF HAPPENS WHEN THE RULE BOOK IS CHUCKED IN THE AIR"
REVIEW: "BRILLIANT STUFF HAPPENS WHEN THE RULE BOOK IS CHUCKED IN THE AIR"
Downend Folk Club is back at Downend School and breaking rules. It can’t be right to drink beer in a school hall, can it? There's more whooping and clapping than is acceptable in your ordinary assembly too. We're even gently chastised for the absence of blazers and ties. Rules are already broken. If we were getting a school report we'd certainly have to “try harder". What teachers never seem to work out though is how much brilliant stuff happens when the rule book is chucked in the air. This evening, BBC Radio 2 Folk Award winning LUCY WARD knows all about the value of breaking rules and the amazing results that can happen. Her latest album Pretty Warnings takes all of those well established folk tropes and throws them about all over the place. If Picasso said that you can only break the rules once you've learned them, then Lucy Ward and her band are the living, folky embodiment of that. Turning a romantic night visiting song into something darker and more twisted on Cold Caller, and then shyly offering up a happy, positive acoustic love song to her recently born son with Sunshine Child. This is not exactly what we expect. Even that most un-folk thing, rock shapes, are thrown during those moments that she relinquishes her acoustic guitar. There's anger and prog-tinged thrashing. It's all a tiny bit bewildering. None more so than the trad tune that ends the first half of her set. Marching Through The Green Grass is an old Ward favourite but it's had a muscular T-Rex style make over. It's all military drumming and glam rock handclaps. Where ever she has decided to take us it's nowhere near your run-of-the-mill folk gig. Like all the best rule breakers though, Lucy Ward and her band always touch base, so we never lose that feeling that everything is OK. On the brilliantly lefty Creatures and Demons she lashes out at the right wing press and their hate filled rhetoric. She nods towards the old guard too with a spookily hypnotic version of The Fair and Tender Ladies, a trad tune lifted from a Peter Bellamy EP. She might lead us away from folk but she always allows us to see the path back again. The path is glimpsed again when The Cruel Mother is re-spun as Mari Vach. Rather than condemning murder however (very folk this), Ward gives us sympathy, empathy and understanding. And so more rules are smashed to bits. With Maria Martin those bits are slowly, sensually danced upon. It's slinky and, whisper it, funky too. Yet it still has proper Northern folk credentials. Something with significantly fewer folk roots is an utterly superb version of the Elvis groover A Little Less Conversation; Lucy Ward proving beyond a shadow of a doubt that she could be one hell of a soul belter. There's not a folk law left undamaged. If all of this rule breaking seems a little edgy then the support act JACK HOPKINSON plays it very straight indeed. The closest he comes to breaking a rule is that he plays country in a folk club. A beautiful type of country it is too. If there's an opposite to the big hat, sexist nonsense that spills from certain American states then this is it. It's gentle, thoughtful and very lovely; delivered with an assurance that forces you to overlook the "travelling on a lost highway" cliches. With so many rules broken detention is surely our only option. See you for that in November. Wear a blazer. And a tie.